The campaign will be launched on September 5th with a pack produced by the Alliance to mobilise church members especially in the UK, US and Canada. the aim is to lobby retailers and politicians to improve wages, safety and working conditions for Bangladeshi garment workers. There are over 3,500,000 workers in the industry that produces 80 per cent of Bangladeshi export earnings. The campaign launch will be at Methodist Central Hall, with Bishop Paul Sarker, Moderator of the Church of Bangladesh, joining the event via Skype. The campaign follows action by Bishop Paul to support the injured and bereaved families after the Rana Plaza factory collapse at Savar, Dhaka, Bangladesh in which over 1,000 died and thousands more were injured. Global justice for Bangladesh garment workers who are paid USD$0.15 an hour compared with $16 for their US counterparts. Wage justice for the workers who are paid only 14 per cent of the living wage in Bangladesh, with women in the industry earning much less than men. Living justice – over 1,800 Bangladesh garment workers are estimated to have died in factory collapses and fires since 2005. It provides an action plan for grassroots campaigning, and a letter for consumers to send to their retailers demanding improvements to the pay and working conditions of garment workers. Real-life stories from garment workers in Bangladesh also highlight the oppression they face and the struggle to survive. The Alliance is involving students in the campaign, through linking up with organisations on campuses in the UK. 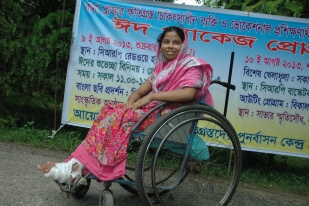 In the picture: Sabina, a garment worker injured in the Rana Plaza collapse.